I like pigs. That’s right. I don’t eat them. I just like them. I always have, since I was a child. I can’t pinpoint an exact moment or reason when or why I started to have an interest in this fine animal, but the pig and I have always shared a strong bond. So it seems timely, as a citizen of the world, that I celebrate the Chinese New Year this week, which of course is the Year of the Pig. From what I have read, the Year of the Pig is the twelfth of the 12-year cycle of animals which appear in the Chinese zodiac related to the Chinese calendar. Other great animals are part of this, like the dog, rabbit and tiger, but really, no animal is as interesting or as sophisticated as the pig. They are fast. Can you run a 7-minute mile? Adult pigs can run up to 11 miles per hour. Why don’t you try that? The expression “sweat like a pig” is not accurate. Pigs don’t really sweat – they like to cool off in the mud. That’s why you think they are dirty. But they’re just hot! If my daughter’s room looked like a pig sty, I’d be thrilled. They may roll in mud to cool off, but they are naturally very clean and organized. Pigs self-potty train, and new research shows that in an open barnyard pen they will establish a community toilet. They are chatty creatures and know how to communicate with each other. They use different kinds of vocalizations to speakto each other. Those aren’t just squeals. They are not picky eaters. They will eat anything. Can you say that about your children? Maybe they don’t see so well, but wow do they have an excellent sense of smell. Just ask someone who likes to eat truffles (and I mean mushrooms, not chocolate). It’s not just my daughter who is sociable – so are pigs. They like to be together and snuggle together when they sleep. You are not that different from a pig, genetically I mean. Their stem cells are helping us humans for research into countless diseases. This one is interesting, especially as we celebrate the Chinese New Year – pigs are associated with fertility in Chinese culture. So many hidden talents. So you can see why I like pigs. I could tell you at least 10 more great things about this animal. I will admit I don’t want one for a pet. They may be domesticated, but I don’t think I’m ready to take that leap. But if anyone wanders around my house, it won’t take long to see hints of the pinky pig all over the place. Yes, I literally have dozens of the stuffy kind all over my house, led by the big and cutest one, my long-time friend Taloulah (yes that’s her in the photo at the top of this post). 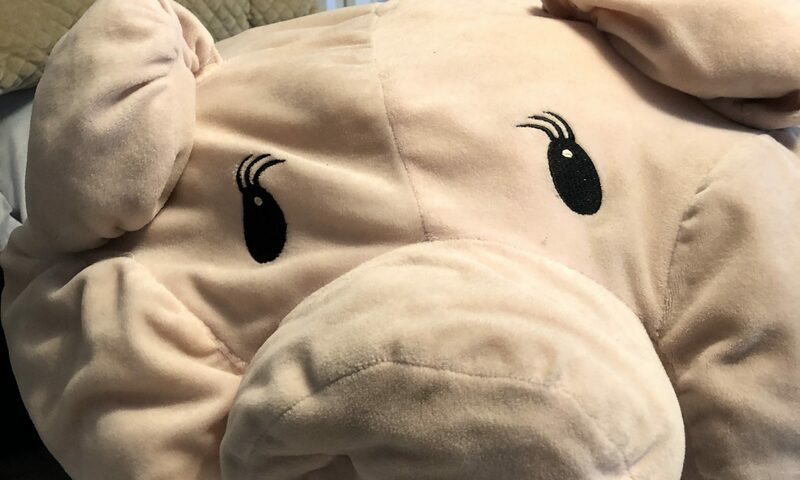 This giant stuffed pig joined me when David and I lived around the world early in our marriage. I was so worried about Taloulah flying safely from France to Israel back in 1999 that I made David take my lovable friend as carry-on luggage on the journey. I still giggle at the thought of a grown man wandering through Charles de Gaulle airport with a giant stuffed pig under his arm! The collectibles never went too far, but the friendly pig paraphernalia definitely permeates throughout my house. There’s the kitchen ice cream scoop or the citrus squeezer. Pillows and picture frames. Socks and t-shirts. It’s just enough to keep me happy but not too much to overwhelm and take over. So this week, as Chinese communities around the world celebrate the new year and put the pig up on a pedestal, where it’s supposed to be, I will celebrate with them. As will Porky, Miss Piggy, Olivia and of course, Peppa too. Do you want to have a Snow Day? 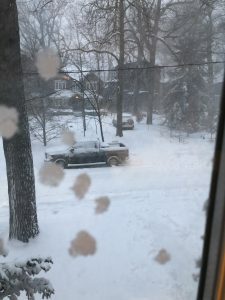 Some people would describe a massive snowstorm as terrible and nasty. They shudder at the prospect of cleaning heavy snow off their car, a longer commute to work and slippery sidewalks. It’s just miserable. Then there are people like me who perk up and get excited when they hear the word snow. When I saw the weather forecast a few days ago that a big storm was headed my way, my first thought: snow day. 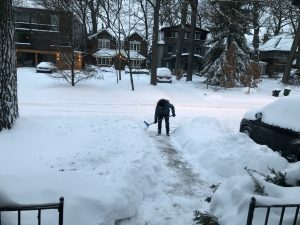 A rather big snow storm blew through Toronto on Monday. For those of you who live in cities who get big storms all the time, sure laugh at us. But I’m sure that a solid 35 cm of the white stuff fell on my front lawn. And all over Toronto. The city was crazy and hectic. But as I sat at home and looked out my window, I saw the beauty of my neighbourhood covered in a shiny white blanket. Tuesday morning, 6:40 am. My cell phone rings. I ignore it. Ten minutes later the phone rings again. I turn off the ringer. My morning radio alarm goes on and they are reading out the list of school closures. I check my phone. Email from the kids’ school. It’s closed. Phone rings again and I finally answer it. The preschool is closed. I firmly believe that a snow day is one of the greatest highlights of childhood. 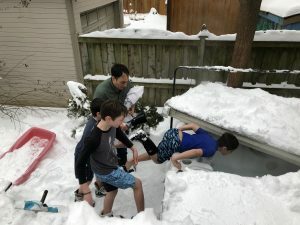 Every child has to experience at least one snow day. You wake up groggy from the night and your parents tell you, guess what, school is closed – snow day! 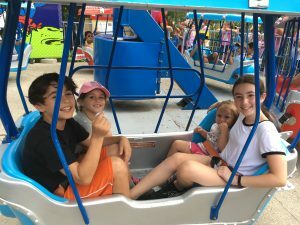 The look of joy on my children’s faces was something I will remember for a long time. Pure happiness. Stay in your pyjamas. Make a big batch of French toast. Turn on the TV and watch morning cartoons (update for 2019: pull out the ipad and click on the Netflix app). Sit back and relax. I looked out my front window and quickly came to the conclusion that I wasn’t going anywhere either. Getting dressed meant throwing on a pair of old sweatpants and breakfast was a homemade espresso and leftover french toast. I flicked on my laptop and did my best to hide in my home office to work. By midday I had actually accomplished quite a bit of work. There were six children in my house, including the kids’ friends and my nephew. We were settling in for a cozy day. 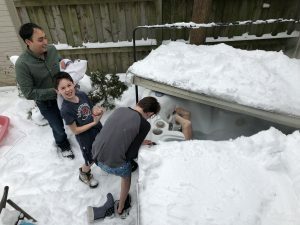 After they downed a few boxes of Annie’s mac and cheese, it was time to throw them outside. 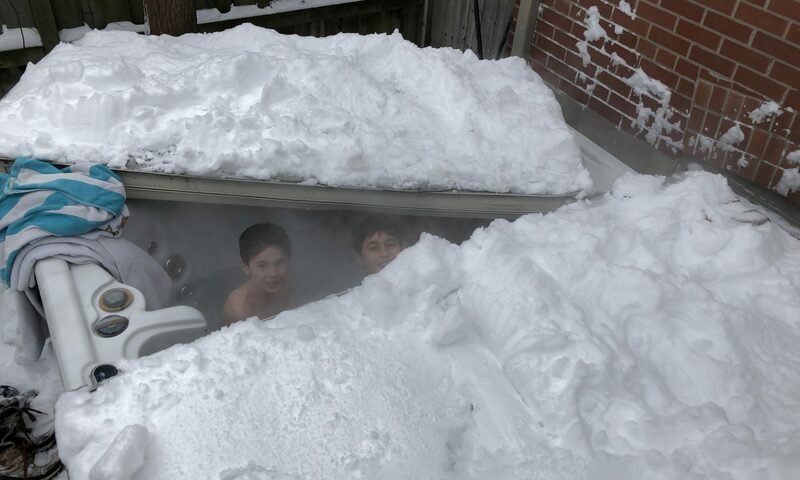 What child doesn’t want to run around outside after a huge snowfall? What parent doesn’t want to throw them out there after said children slowly started to trash every corner of the house? I don’t know what the three boys did outside, but after a couple of hours in front of an ipad or XBOX, these border collies needed their run. Again, thank you tons of snow for providing great entertainment for them. My two-year-old wasn’t quite as happy. She couldn’t move outside in the waist-deep snow (ya that happens when you are a few inches under three feet tall). As the afternoon wore on, the brood of children grew restless, in particular the boys. So isn’t it logical to throw on a bathing suit and jump in the hot tub? If you are 10 or 11 years old, sure! 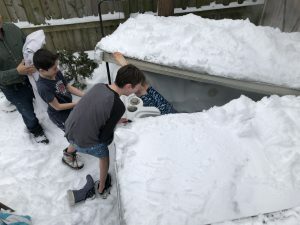 Minus ten (or something close to that) and a foot of snow is a great appetizer to a 95-degree vat of water. Everywhere I looked in my house all day a different activity was going on. My older daughter was hosting a Playmobil pool party in her bedroom. My son took full advantage of his selection of XBOX games in the basement. The baby traveled from room to room, sharing her toys and snacks with the couch, the floor, her clothes and her siblings’ bedrooms. David and I switched off between work and cleaning up after the pack of kids. On first read it sounds like the local zoo, but it was bliss. Outside it was freezing cold with layers of snow blanketing every corner of the city. And inside everyone was cheerful and drinking in every moment of this special day. And as the sun began to set on the day, the fun continued. My nephew and son announced their interest to go night snowboarding at a local small but decent little hill – right in the middle of the city. My daughter definitely had a bit of cabin fever and eagerly went to her karate class. We didn’t waste a minute of the day. Good food, good friends and good fun. Who could ask for more? Maybe another snow day tomorrow? My kids were quite sure of that as they drifted off to sleep. It was a great snow day, indeed, but another one tomorrow? Ah, I don’t think so. My husband and I have a large extended family. And that large extended family lives all over the world. It is easy for a family to lose touch, and for relationships to fade away when brothers, sisters and cousins live far away from each other. Sheer distance and time zones bring on tremendous challenges to stick together and be close. Our extended family is tight. And I mean all of our family – my aunts, uncles and cousins – David’s brothers and sisters, nieces, nephews – and everyone in between. Our three children have three aunts and four uncles (double that if you include spouses, and we do! ), fifteen first cousins and countless great-aunts, great-uncles and other cousins too. These relatives live all over the world, including Great Britain, New Zealand, Canada, the United States and Israel. It is because of this close relationship with our extended family that we are in Israel right now. 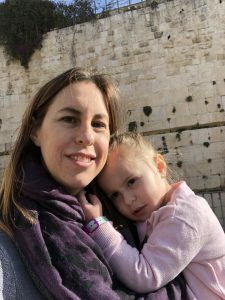 Traveling to Israel from Canada is long and expensive. But it’s worth it, just to spend time with our extended family. During our current visit to Israel we are celebrating a niece’s Bat Mitzvah, a nephew’s Bar Mitzvah and even a nephew’s wedding party. 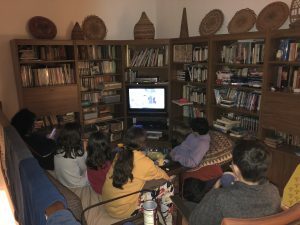 They all kindly coordinated their events to occur close to each other to accommodate family who had to travel from all corners of the world (thank you!). That’s David in the middle, with his nephew, Ariel, at Ariel’s Bar Mitzvah. 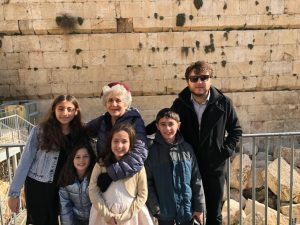 That’s my mother-in-law at the Kotel’s southern wall with grandchildren from four of five of her children. I will admit, late December into early January is not my ideal time of year to travel overseas. I am an avid skier, winter storms can halt plans and the costs can be higher. But as I have stated many times, we tend, as a society, to stop everything and travel to the ends of the world when there is a crisis or death. But why don’t we do the same for a celebration – or better said in Hebrew, for a Simcha? It’s rare to get all five children together. That’s four of eight granddaughters. For me, missing a family celebration, no matter where it happens in the world, is a missed opportunity. I understand that not everyone has the luxury to travel to see family. But if you can, then do it! But it’s not just about traveling to the other side of the globe – keeping in close touch with family is easier than ever. While some may say that technology is pulling us apart, with the new Screen Generation, it is also bringing us together. Cousins hanging out on New Years Eve. Always a different group going out. This is dinner at the mall’s food court. David’s large extended family, whose foundation and soul is their sacred home in St. Donat, Quebec, established a group on WhatsApp called St. Donat Suckers. This ever-growing chat group posts photos, thoughts, recipes and celebratory messages every day. We share our achievements and personal anecdotes. Because of this wonderful piece of technology, no one feels they are missing anything, anytime. Our deck was a good hangout spot in Ein Gedi. Looking at the view or posting to WhatsApp. Did you hear about that new sushi restaurant in West Seattle? How about the incredible hike in Northern New Zealand? 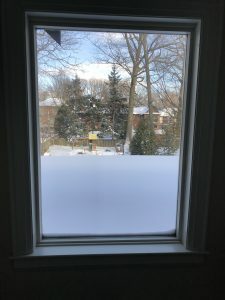 Huge snowstorm in Ottawa. Nephew is engaged. Cousin bought a new house. Facebook is great. So is Instagram. But the text message is quick and direct. 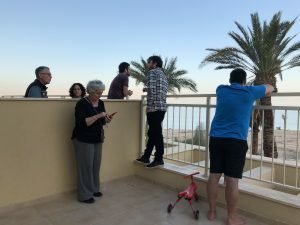 While I travel through Israel I send regular text messages to a text message group I put together with my extended family. I post a photo of my son in a cave and seconds later I see a photo of Matthew’s cousins at the ski hill, ten thousand kilometers away. We are all over the world, and yet we are together. And right now much of David’s family is together. All five siblings, and their spouses, most of the group of first cousins. His mother, of course. We all just spent a few glorious days together, in honour of our nephew’s Bar Mitzvah, in the desert by the Dead Sea. The desert air and stunning sea views are enough to energize me. Add in quality time with family and you have a winning combination. 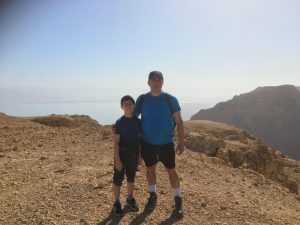 Matthew and David went on a super hike from the Dead Sea and up the mountainside with many cousins. 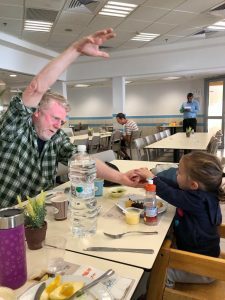 Nessa enjoys breakfast and a story about monsters in Ein Gedi with her Uncle Terry. We are headed home in a few days, back to work and back to school. We may not see many of these relatives for a year or more. But, I am sure we will not lose touch. It may be a twelve hour flight to Israel from Toronto, but it only takes seconds to press send on WhatsApp or text messaging. The world may seem huge at first, but our family keeps it small. On December 31st, 1988, I celebrated my first New Year’s Eve outside of Canada. I will admit that I don’t remember my exact location, but I know it was somewhere in Israel. Maybe Jerusalem? Or Tel Aviv? Somewhere in the north? 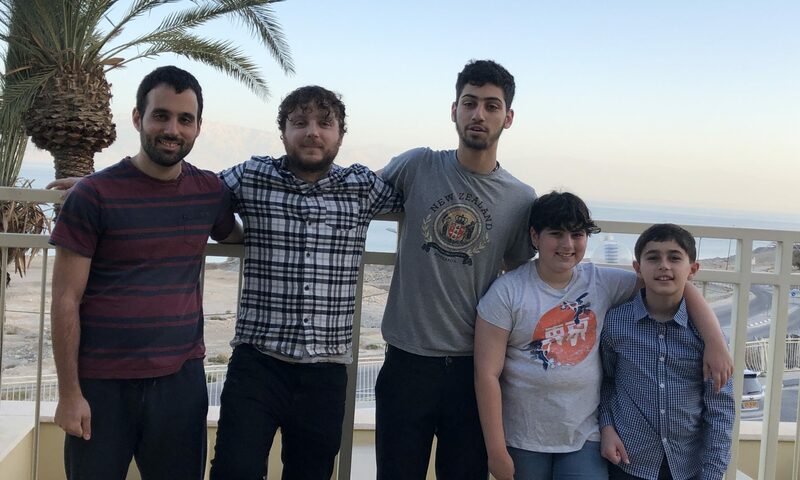 My family came to Israel to celebrate my Bat Mitzvah. It would be my first of many trips to this wonderful place. 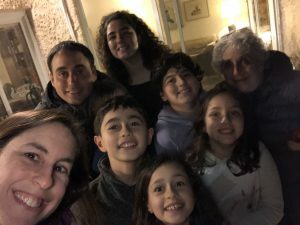 On December 31st, 2018, exactly 30 years later, I was here again, in Israel, celebrating with more family. During our two-week visit we are attending not just a Bat Mitzvah, but also a Bar Mitzvah and a wedding party. Israel has seen tremendous change over the past 30 years, but my joy to be here has not changed. B’shana ha ba’a b’yerushalayim. 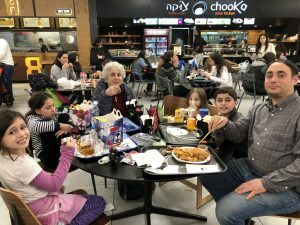 – next year in Jerusalem – is something Jewish people say not only at the end of the Passover seder, but throughout the year. There is a deep historical and personal connection we have with this ancient city. Memories of my first visit there, back in December 1988, will stay with me forever. As I joked on New Year’s Eve a few nights ago, as we counted down the clock to midnight, I. planned to check that off my list first thing in the new year with a visit to Jerusalem on January 1st! Hey, we all make New Year’s resolutions, and I’m taking mine seriously. Check! 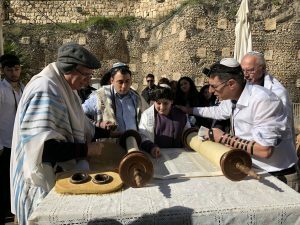 And sure enough, on January 1st, I went to Jerusalem, to celebrate a brand new year and to also, gulp, start planning my son, Matthew’s Bar Mitzvah. My son will turn 13 in 2020. That’s next year. And he, like so many children before him, for thousands of years, will read from the Torah in this most sacred of cities. I have had the opportunity to visit Jerusalem twice during this trip, and I have to say, I both love and hate this city. I love Jerusalem because it is steeped in history. At every turn you come across a spot that plays a significant role for one of the world’s major religions. The city sits across seven hills, and on a clear day there are breathtaking views in every direction. Within a few hundred meters of each other you can visit Christianity’s Church of the Holy Sepulcher, Islam’s Al Aqsa Mosque and the outer walls of Judaism’s Temple Mount. I won’t get into the politics and religious differences in terms of the logistics of actually visiting all three sites, but let’s say, in theory, because of sheer proximity, one can do this. 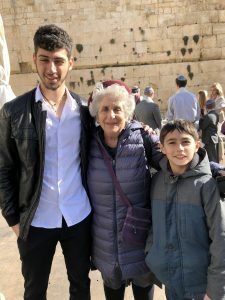 Celebrating his cousin Ariel’s Bar Mitzvah, Matthew with his grandmother and cousin, Elia, at the Temple’s Southern Wall. Selfie with a slightly sleepy Nessa. Selfie with a slightly more awake Matthew. One of my favourite bakeries in the whole world, Marzipan, sits in the centre of Jerusalem. No one can load chocolate into a small pastry like they can. 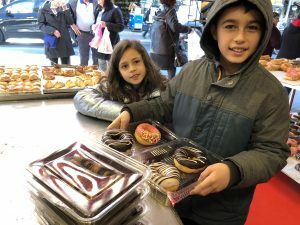 And behind this bakery sits a world famous market, where you can find a mix of fresh fruit and vegetables, spices, baked goods and nick knacks, and vendors hollering at shoppers and each other! So you ask, what’s not to love about this glorious city? A lot, I say. Try driving through Jerusalem. It’s awful. Try parking. Even worse. It’s crowded, loud and kind of dirty. No road or path goes straight and we always get lost. Construction. Masses of people always descending upon the city. And yet, there is no other place where I would want to plan my child’s Bar Mitzvah, just like I insisted for my own 30 years ago. Jerusalem is hectic, crowded and loud. But it’s also mystical and magical. This year in Jerusalem. Check. 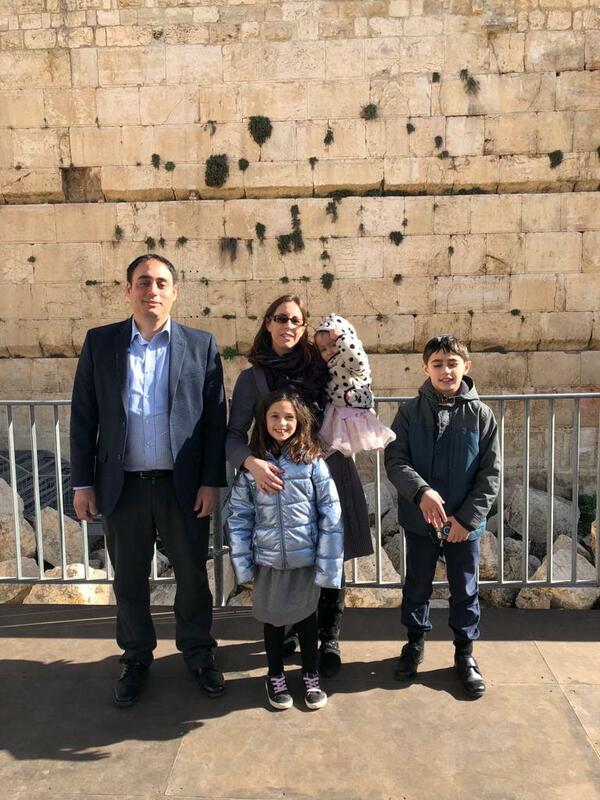 Next year in Jerusalem – see you there in April 2020. I would consider myself to be a decent mother. I indulge my children when they need indulging, push them when they need pushing and discipline them when they clearly need disciplining. My kids are intelligent and feisty, and all three of them have unique traits that make them loveable in their own way. When any one of them is eager to try something new I am happy to encourage them. This was the case when my middle child, Julia, decided she wanted to participate in a karate tournament. I am proud of Julia’s drive to pursue karate. 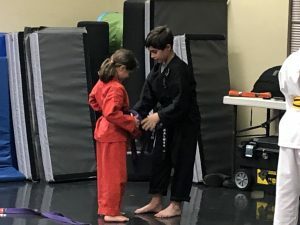 Like her brother, we enrolled Julia in karate lessons at age 4 as we felt that learning some self defense skills and confidence in herself would be invaluable. She took to the sport well and has excelled. At age 8 and many inches under four feet tall, Julia has achieved an advanced purple belt. If you look at her face when she is practicing a kata or puts her fists up ready to spar, you wouldn’t want to meet her in a dark alley! My daughter knows what she’s doing! While Matthew, with a black belt in karate and tremendous strength and poise, shies away from competition, Julia loves it. Matthew would prefer to focus on learning and teaching younger kids. Julia can feel the adrenaline of stepping outside her comfort zone and trying something new, like a tournament. I am much more like Matthew and typically shy away from anything competitive. It’s not that I am scared to lose, I just don’t like the feeling in the air at competitive events. I will admit that they make me uncomfortable. As the saying goes, “those who can’t…. write.” I never played sports well, so that’s why I became a sports journalist! But I digress. 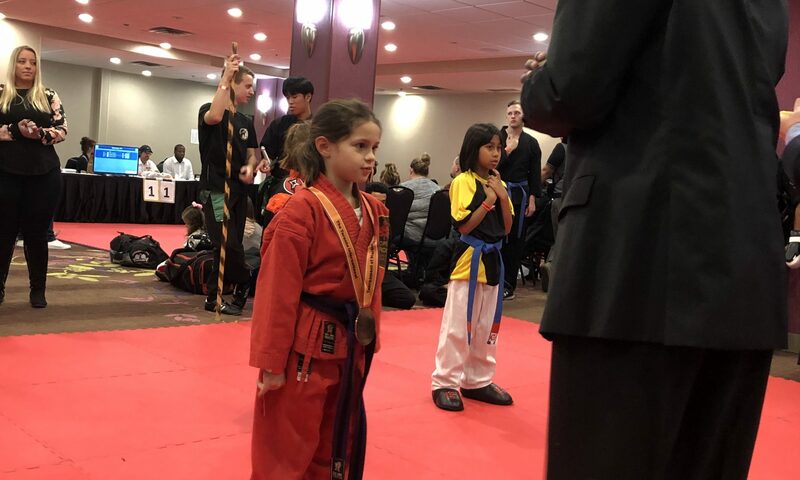 A couple of months ago Julia announced that she wanted to try a karate tournament. The school where she takes lessons hosts and participates in various tournaments throughout the year, and her sensei encouraged her to train and try one. Sure, I thought, why not. Wow, I really knew nothing. Julia has been training and getting extra support after her regular karate class, to boost her confidence in her katas and sparring. She decided that she would only participate in one session – sparring – for her first tournament as she wanted to ease into this new world. I signed her up for her first tournament which we knew would take place in the west-end of Toronto on December 1st. And that’s all I knew. You see, while I am not organized in every aspect of my life, I am a bit of a planner. When I travel, I organize the car rental, hotels and schedule. If I plan a family outing, I take care of the logistics. When I rely on someone else to plan, I get heart palpatations and anxiety. Walking into anything unknown really bothers me. That was the case at the karate tournament. I had a date, an address and a time. That’s it. I kept thinking to myself, I’m sure this event would be organized and well-run. It’s karate after all, a sport based on discipline. Boy was I wrong. We arrived to a place that could best be described as slightly organized chaos. The line-up to register was long and messy. The check-in person kept repeating to me to check the email that was sent to me about Julia’s division. No email was sent to me. She was in division 13, the person told me. That means what, I said? Where does she compete? When does compete? How many other children will be in her competition? No answers. 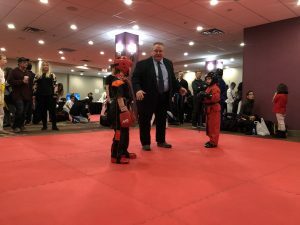 We finally tracked down one of the tournament organizers from our karate school who kindly walked us over to a room on a lower level where children of all ages were getting ready. More chaos. Most of them were warming up like soldiers before a battle but they were four-feet tall and had no shoes or socks on. One kid was running around with what looked like a plastic sword screaming some version of Japanese gibberish, I think. While Julia’s assigned zone was clearly a competitive area for children, I felt no warmth from the other parents. For the most part, it was kids aged 6-12 participating, and wow, those parents took it seriously. Some were hollering at their children to warm up, others were drilling their kids on the right moves. Others sat there on their phones and held seats for people who never showed up. Not a friendly face around me. I had clearly stepped out of my usual comfortable space and into another realm. The one smiling face came from the mother of Julia’s friend, who has been taking her 7-year-old daughter to tournaments for the last year. She saw the stress on my face and tears in my daughter’s eyes as we both stood there overwhelmed and terrified. And her sweet, chatty daughter (like mine) put the cheer back into Julia’s face. Thank goodness for that. We waited and kept hoping Julia’s turn would come soon. Patience is not one of my daughter’s virtues, especially when she was feeling anxious about her first tournament. Competition like this is new to her, she had limited training and she is tiny! I looked around and noticed that, as usual, the children in her age and category were a bit older, had more training and were much bigger. Julia has worked hard and is a very confident little girl, but this was a bit much, even for her (and me!). She got her fighting face on and focused. Julia sparred against a girl who was definitely older, had a brown belt and was over a head taller. She didn’t have a chance. But, like the shining light that she always is, Julia rose to the occasion and tried her best. She got a few kicks in and threw a fair number of punches. Julia lost her match but she won the day. She walked away with a shiny bronze medal (yes there were only 3 kids in her group but so what) and her head held high. She even said she wants to compete again, and this time with a kata. And her father will take her to the next one. Julia listened carefully to the rules before she sparred with the other girl. Competition and tournaments are not for the faint of heart. They are chaotic, rough and people can be downright mean. I think the most aggressive people in the room were the parents of the 7-year-olds. How can anyone push a child that way? That is not for me. Or for my daughter. If you want to win, great, go for it. But can’t an 8-year-old have fun too? I still have in my mind the crushed look on the faces of some of those kids who scored too low to get a medal. And the look on the parents’ faces weren’t any better. My message: get over it. Relax. Have fun. The junior division of a karate tournament is not worth getting so stressed out. So I survived and so did Julia. And yes, she even get her own souvenir medal.. Maybe she will try it again. Maybe she won’t. But no matter what she chooses, I will always be proud, as I am a decent mother. Recently, as I was preparing dinner for my family, at about 6:30 pm, my doorbell rang. I wasn’t expecting anyone but checked to see who it could be anyway. I looked through the glass of my front door and saw a young man, and through the closed door asked him what he wanted. A donation to his charity, he said. I responded, no thank you, and I walked away. 5 minutes later my doorbell rang again. Once again I looked through the glass of my front door, and this time it was someone campaigning for the municipal election. Both of these people infuriated me. They dared invade the sanctuary of my home. This really upset me. I have not written a blog post in many weeks. It’s not for a lack of ideas, and so many of them are swirling through my head every day. I am desperate to write, as writing relieves all stress in my daily life and really calms me. 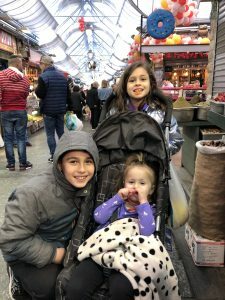 I have been extremely busy with a new, very full-time job, three children in school, a husband with a new consulting business and an attempt to balance my work demands with my family’s needs. Every time I steal away a few minutes on my own I have had no strength to write. But this weekend I had to write. After the heinous attack on the Jewish community in Pittsburgh, one of the first words that came to my mind was sanctuary. 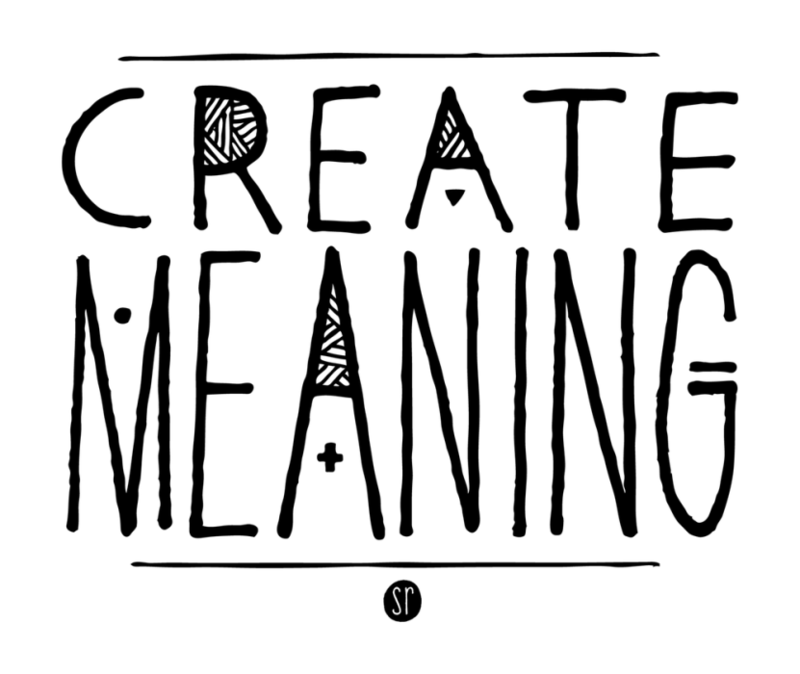 It has many meanings, and two in particular are on my mind right now. As I wrote above, my home is my sanctuary. It is the one and only place in this vast, sometimes scary world, that is mine, where I should feel safe and where I can simply escape. My home is where my family eats, sleeps, screams, laughs, cuddles and cries. Our home belongs to us, and we do not have to allow anyone in when we don’t want to. So when someone rings my doorbell in the evening, when I am in the sanctuary of my home, with my family, they have violated my private space. It irks me. I don’t like it. 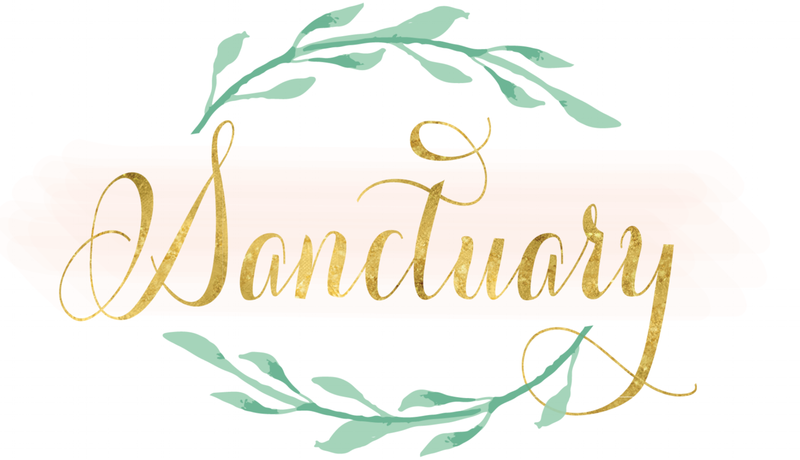 Until this weekend I never really thought more deeply about another way I think of the word sanctuary. It is often the term people use to describe the main, usually largest, space in which Jews pray in a synagogue. For example, I got married in the “main sanctuary” of my family’s synagogue. It never occurred to me the deeper meaning of what that represents to the Jewish community until this Saturday, this past Shabbat, as congregants gathered in the sanctuary of their synagogue to do no more than pray. The synagogue’s, church’s or mosque’s sanctuary, or the central space in which any religious group prays, is sacred, and it is the extension of the home. We pray in the house of worship’s sanctuary together, as a community, and we feel safe. When we are in that sanctuary – in our own home or our synagogue, we don’t expect anyone to disrupt that peace and sense of calm. Someone ringing my doorbell, asking for a donation, to sell me something or convince me to vote for them, is terribly annoying. It bothers me. It threatens my sanctuary. Someone who bursts through the doors of a synagogue, who tears through the sanctuary, while people are praying, shouting “Death to the Jews” then murders them, is repulsive. I am actually having trouble thinking of the right words to use to describe my feelings about how an individual violated the sanctuary of a group of worshippers on the Sabbath and killed them in cold blood. For eleven people, one man took away their lives. For a whole community, he took away our sanctuary. He took away our right to have a sacred place to come together – not only to pray, but to feel safe. Everyone deserves to have a sanctuary, in their own home or in their place of worship. My home will always be my main sanctuary. And I hope that the hateful act of one man will not take away the other one. I am not a deeply religious person. 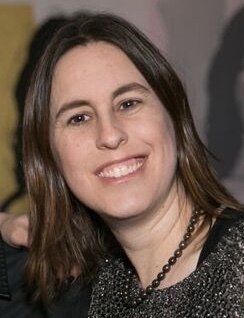 I had a rather traditional upbringing, was educated at a Jewish Day School and attended synagogue with my family on a relatively regular basis. We observed Judaism to the best of our ability, and I have brought my various experiences and beliefs along with me throughout my life. 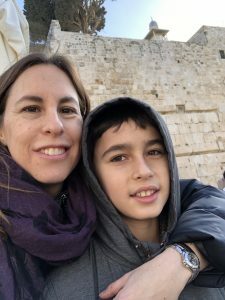 This time of year has always been a challenge for me, with so many Jewish holidays packed in together, mixed in with the changing seasons and new school year. People pass around sweet New Year’s greetings, a wish to be inscribed in the Book of Life and a hope to find meaning as we atone and start fresh again. Every year, as I receive countless kind holiday greetings from family and friends, I always take an extra moment to think and sometimes question why I am asked to find meaning in this time of year. It seems like an abstract word to me as it can be understood in so many ways. I usually just ponder the word for a few minutes then move along with my day, but this year I can’t get the word out of my head. How can a holiday, one day or one experience bring meaning to my life? Does it affect me in a positive or negative way? Do I have to take any specific actions in order to find meaning? Can one only find true meaning during Rosh Hashanah (The Jewish New Year) or Yom Kippur (Day of Atonement) if you go to synagogue and pray? 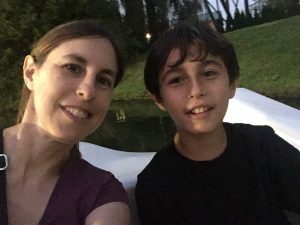 My husband and I decided to not attend synagogue this year during the High Holidays and instead chose to stay at home with our children. We have had a challenging year. While we are headed in a positive (and I think exciting!) direction, when we had to make the decision during the summer to purchase synagogue tickets, we felt that our hearts just weren’t in it. Would we find meaning in praying among family and friends or would find that true meaning at home, with our children? The choice was easy. Now that those two holidays are over I can reflect on the decision to stay home this year, and I don’t regret it. I have never connected on an emotional level, in a meaningful way, sitting (or standing) in a synagogue. Prayer has not come naturally to me and has not uplifted me spiritually. 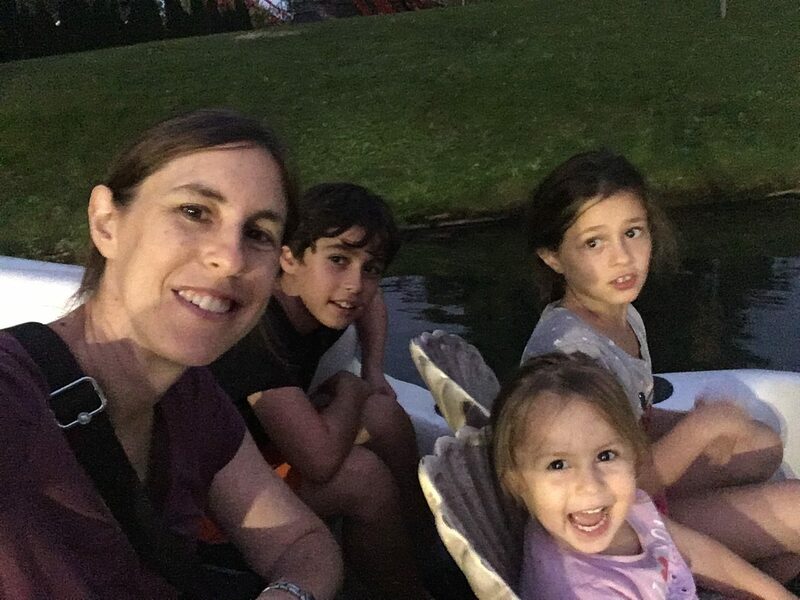 With the kind of year I have had, often feeling overwhelmed or deeply stressed, I knew that what was best for me – and my family – was to take some time at home. On Tuesday afternoon I browsed through countless Facebook posts as people prepared for Yom Kippur, the Day of Atonement. Yom Kippur is not supposed to be enjoyable and relaxing. It is a day of denial – no food, no bathing, for example – so you can reflect and start fresh. You think about what you have done wrong, how you may have wronged people and hope for forgiveness. Some people are able to find that meaning through prayer, but again, that is not the case for me. I find meaning in my life and am able to reflect on my life by spending time by myself, in a quiet place, or by writing. And on Wednesday I found meaning as I sat around the dining room table with my husband and children as we played a board game. She did what? 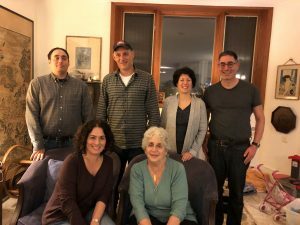 On Yom Kippur she sat at home in her sweatpants and played board games? That’s right I did, and it was one of the best decisions I have ever made. I spend so much of my life running around, chasing my children, balancing schedules or yelling at one person or another. Life seems to be go go go. 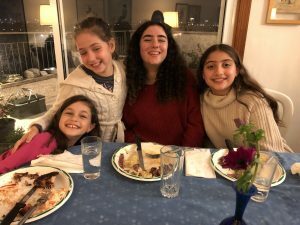 But this year, on Yom Kippur, instead of dressing up, forcing my kids out the door and making everyone stay quiet at synagogue, we just stayed home and spent quality time together. I literally had nothing to do but be with my family, talk to them, laugh with them and enjoy their company. And while I did not attend synagogue, I did strictly observe the rest of the Day of Atonement. I denied myself food for 25 hours, and it was definitely tough. My body is not used to fasting, and at times I felt tired and a bit unwell. But as the day wore and I had time to think about my life and the choices I make. I found meaning. I don’t know what the next year will bring for me and my family. My children have all embarked on a new year of school, David is balancing various offers to consult on exciting projects and I am a few weeks in to a new and very demanding job. As we move into that new year I want to say I am sorry to anyone who I may have hurt or offended this past year. I wish you all a year of success and may you find meaning in your life as well. The first for everything we experience in life is special. Sometimes it’s sensational or thrilling. And sometimes it can be scary or downright terrifying. Or maybe all of the above. The first day of spring brings with it the joy of warmth and growth. A child’s first word or first steps bring delight about the anticipation of a developing little human being. The first day of school comes with a mix of trepidation and excitement every year. The first day of a new job can be stressful, exhilarating and petrifying all at the same moment. We experienced a few firsts this week in our family, and for sure there has been quite a mix of emotions. Tuesday was the first day of school for many children across Canada. 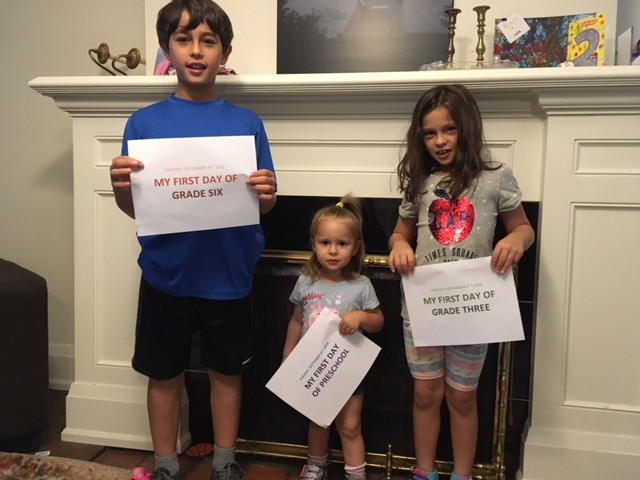 For my oldest two children it was the first day at the same school they have always known, but of course in the next grade. With every new school year there are changes and growth with elevated expectations for the child. There’s a new teacher, sometimes a new classroom and a few new students to meet. The child is nervous and jittery, and taking that step into the school hallway and into the classroom can be tough. My son ran away and barely waved good bye. My daughter got a bit teary-eyed as we walked away from her grade 3 classroom. For my youngest, my baby, Nessa, it was literally her first day of school. She’s only going to preschool, but this is a huge step for such a tiny person. 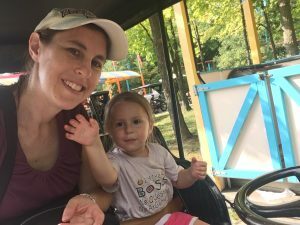 She has always been home with me or a caregiver, and this week represented the first time this little two-year-old went out into the world. Okay, she wasn’t walking the floor of the Stock Exchange or selling lottery tickets from a kiosk, but it was her first day out of the house, in a brand-new environment. That’s a big step for anyone, and she made it through like a champion. There were a few tears, but she perked up when she saw the baby dolls, plastic food, and so I’m told, lunch. When Nessa’s tears began to flow at drop-off I swiftly gave her a kiss on her forehead and was out the door. She’s my third child, and I know how it goes. I remember the first time I dropped off my son at daycare when he was only 11 months old. He was my first child. I don’t know if he cried, but I did! 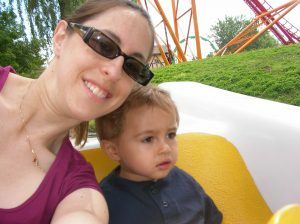 I sobbed outside, on the steps of his daycare, feeling guilty that I had abandoned my child. By number three I sure didn’t feel this way and easily waved good bye and ran. But I didn’t run home because on Tuesday I also experienced my first day. I didn’t go back to school but I started a new, full-time job. As I have written a number of times here in my blog, I have been on a journey the last two years to find the next steps on my career path. I established my own small business doing consulting and contract work in communications, and of course this blog. I wanted to figure out what’s best for me professionally, where I could bring value and contribute to an organization in a meaningful way. It took me a while to figure it out and I definitely have hit some speed bumps over the last year. A few months ago I was offered a full-time position at a company where I was doing contract work, and it was the right fit. After a lot of planning, both logistically and mentally, Tuesday was my first day back at work full-time. It was an overwhelming day with more information thrown my way than I could ever absorb. But the first day turned into a second day on Wednesday. And it was much less overwhelming and much more productive and fulfilling. So the first day is exciting and terrifying. The second day is a bit calmer and less scary. When we get to the third, fourth, fifth day and beyond we get comfortable and confident. We will all experience many more firsts in life, and I hope they are as successful as the ones my family and I had this week. I snagged a great parking spot yesterday. Do you know that wonderful feeling when you enter a parking lot that looks full, you turn the corner, and there, in front of you is a fabulous parking spot? That was me yesterday. I drove into the parking lot at the absolute perfect time, just after someone had left but before another car pulled in 30 seconds after me. 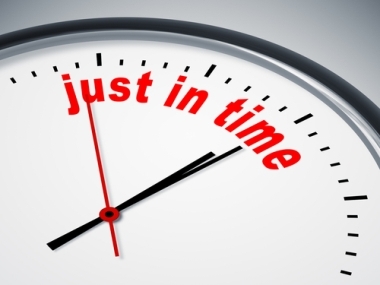 I firmly believe that much is determined in my life, or life in general, by doing something just in the nick of time. This idea came to me last month, during my trip to Scotland. Over a period of about 5 days, David and I road tripped all over central and northern Scotland. We zig zagged and crisscrossed this beautiful country and drove some big distances. Even though we were on vacation and were relaxed, we had to always keep track of time to ensure we arrived at each location when it was open or not over crowded. 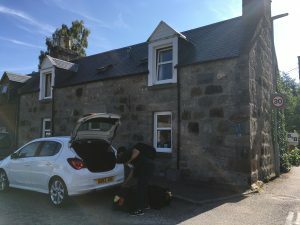 There was one day of our trip, as we traveled from the sweet village of Braemar, deep in the Highlands in the Cairngorms National Park, all the way down to Edinburgh. I had packed a lot into our itinerary that day and was nervous that my plans could fall apart and topple over like dominos if the timing wasn’t right. We woke up early and enjoyed a tasty homemade breakfast of fruit, eggs, mushrooms and tomatoes at our bed and breakfast. We packed up the car and were on the road just after 9:00 am. This was day four of our trip, so by now we had figured out that roads don’t go straight in Scotland and that distances are much further than they look on a map. Put together windy twisty roads, driving on the other side of said roads, in a manual car and we definitely had some challenges. But with enough time, we knew it could all work. We drove directly south from Braemar, through thick forests and mountains. As the road continued to curve, we left forests and made our way through what I had always visualized was the true Scottish Highlands. We saw bare rocky mountainsides, with sheep grazing. The sun was shining and the sky was blue (okay not typical Scottish but it worked for me!). We even drove past a ski resort. 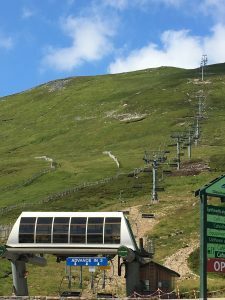 I looked at my watch to check the time and told David to pull over so that I could take a photo of a chairlift, in the middle of Scotland. I had to stop and take a photo. 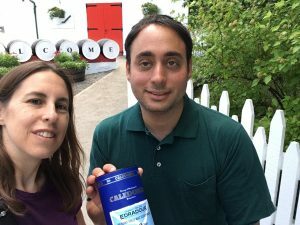 I jumped back in the car and we made our way to Edradour, a small, unique single malt Scottish whiskey distillery. We parked and walked into the visitor’s centre to enquire about joining a tour. The lady at the info desk said, “You arrived at the perfect time. Our next tour starts in about 10 minutes.” We bought our tickets and had just enough time to make our way leisurely to the tour meeting point. After our tour, led by a most entertaining, plump and friendly guide who is definitely a bit of a lush (and a sample or two of the product), we got back in our car and continued south. We were heading into an area in central Scotland with so many sights to see that I knew we had to choose carefully. By now it was about noon and I knew that many attractions closed between 4-6 pm. We decided to make our way to Doune Castle, a fortress built in the 14th century by Robert Stuart, the Duke of Albany. I had read good reviews and also knew that Monty Python’s famous Holy Grail was filmed there. We entered the main courtyard just as a pair of “historic comedians” had begun a live action tale of the castle’s history. They were funny, witty and very entertaining. 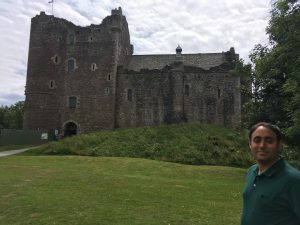 I learned a lot about 14th and 15th century Scotland and about the castle where I stood. We then toured the buildings and grounds and were back on our way again. 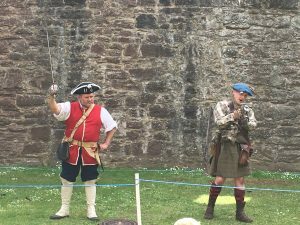 These two were just hysterical and made our visit to Doune Castle very memorable. And so we did. Our colourful guide started the just as we walked up to the meeting point at 4:00 pm and gave us a thorough behind-the-scenes tour of this spectacular castle. And just as our tour was coming to an end, as we stood beside the medieval chapel, we heard bagpipes blaring as a wedding was set to begin. Our tour group looked like the local paparazzi as they pulled out their smartphones to record the event. 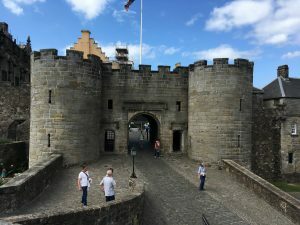 This is the entrance to Stirling Castle. Does your house look like that? At this point it was 5:00 pm. We picked up a little snack and I felt great that we had toured three important places in central Scotland. We had more than enough time to make our way to Glasgow for the evening to have dinner with a new-found distant cousin. But David wasn’t ready for Glasgow. First, he wanted to drive over, just an 8 km drive, to the William Wallace Monument, to pick up a specific souvenir. I freaked out. I figured for sure it was already closed and we had visited this place a few days before when we first arrived. This monument is situated high up on the top of a hill that is accessed by foot or a rare shuttle bus that is inconsistent. David had seen his dream souvenir, an actual replica Morning Star, at the monument’s gift shop three days earlier and suddenly decided he had to have it. All my timing had gone well all day and it was about to fall apart. I finally gave in and we drove the short distance to the monument’s base. I figured it would be closed and we could be on our way quickly. We arrived in the parking lot at about 5:45 pm and learned that it was open until 6:00. But there was no way we could hike back up to the monument in time. Oh, no problem, said the person at the info desk. She called the shuttle driver, and a moment later we had a private vehicle taking us up the mountain to the monument. We got out of the vehicle at 5:55 pm and our driver said he’d be right back to bring us down the mountain. We walked into the gift shop and there it was, David’s Morning Star. Fifty Pounds later David had his precious souvenir, just as they were locking the doors. We walked outside and there was our driver, ready to take us back down. Talk about just in the nick of time. 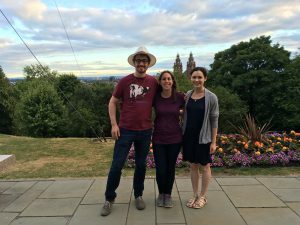 We enjoyed a delicious dinner in Glasgow that night with our new-found Richler cousins, got a tour of the University of Glasgow then drove to the airport to return our car. Then we hopped on the last tram of the night to the city at 10:30 pm and pulled up to our hotel in Edinburgh around 11:00 pm. We were exhausted and fell over soon after into a deep sleep. David and I had traveled a huge distance that day, with an ambitious itinerary, and we did it. We did it all, because time was on our side. Whether it’s arriving at an attraction, joining a tour or snagging that special parking spot, doing it in the nick of time feels great.